Tonight at the top end of Temple Square, (off Matthew St) Liverpool emerges the newest and most swinging club in town - "The first dedicated Burlesque and Cabaret/Variety venue in Liverpool". 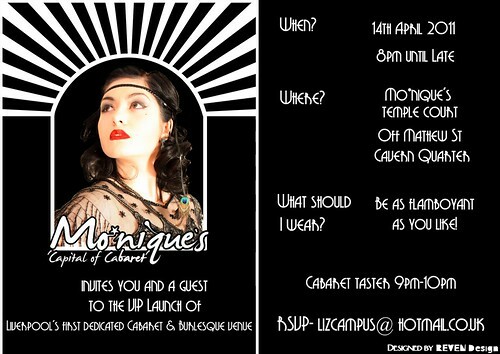 We were privileged to be invited to the VIP launch of Liverpool's new Burlesque and cabaret club simply named Mo*niques. Greeted at the door, with a fiery welcome were the luscious fire ladies from Monster Cirque, flying their twisted flames around the entrance and the tallest woman in town (on stilts). This would prove to be an all out alternative, glamorous and auspicious occasion. As we cruise down the metal staircase, a huge bird cage sits at the foot of the stairs, housing an alluring siren (again from the Monster Cirque stable), swinging nonchalantly on the seat. Vintage style makeovers are being conducted under the stairs and no expense has been spared with the decor, which is to die for, from lush sofas in black and red, with silver cushions. A huge Marilyn statue sets the tone, with ornate mirrors and chandeliers forming part of this lush nightclub. We have the delightfully, delicious hostesses, plying us with free food ranging from delicious strawberry cupcakes, to candy floss, savoury wraps, lollypops and even a champagne fountain. From the packed to the rafters club tonight, we had all ages and styles, from drag queens, vintage lovers, to the glam set, it's quite clear that this is exactly what Liverpool needs, and already Mo*niqies has all the hallmarks of a club destined to take flight. We head up to the second floor for the ‘teaser’ cabaret show, which was to be a little compilation of the kind of variety the club will be offering its clientèle in the forthcoming months. Liz Lacey introduces herself as "Harlot Mascara". 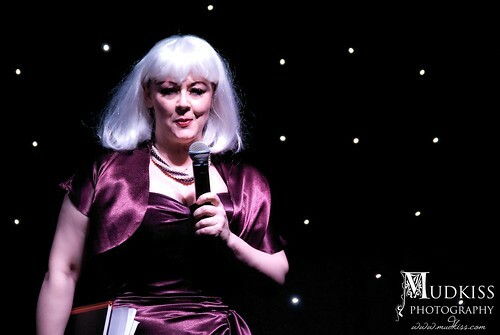 Liz is our Compare for the evening and seductively guides the introduction for the entertainment and whets our appetite with this introduction - "We are going to titillate, tempt and seduce you tonight". So, with a heightened anticipation the show commences. 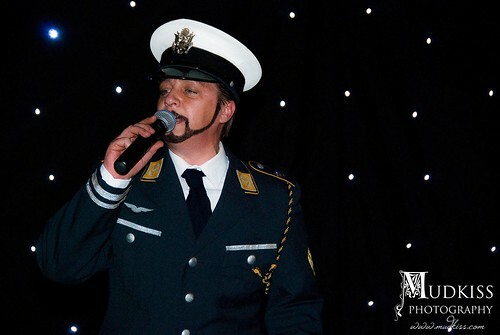 We were treated to a array of acts, each performing either one or two pieces, firstly it was the turn of excellent crooner Alan Cross to open the show with his rendition of 'Life Is A Cabaret' from the Lisa Minelli Musical 'Cabaret', leading into Chris De Burgh's 'Patricia The Stripper'. Suitably setting the tone for the next show stopping act, bounding onto the stage with ‘A Little Girl From Little Rock’, we witness a homage to Marilyn Monroe & Jane Russell togged out in the costumes from the 1953 Howard Hawks classic musical ‘Gentlemen Prefer Blondes’. Superbly orchestrated by the two crimson sequinned and feathered femmes, known as 'The Hot Rockettes'. Next we had a little comedy sketch from a bunny rabbit duo called simply 'Ladyface' presented by Helen Foster & Lauren Silver. 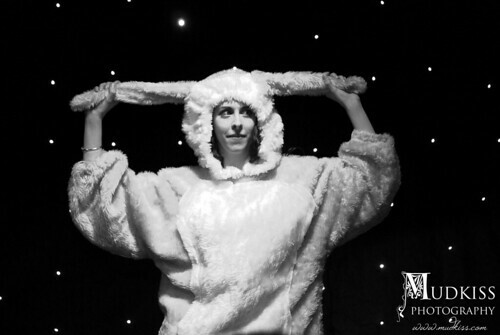 A bunny girl and her rabbit played out their schtick, which the audience loved, a little risqué in parts with a phallic carrot, but all light-hearted harmless shenanigans. http://www.facebook.com/pages/Ladyface/171885082861642? The final act was the pocket-sized (Monster Cirque) fan dancer extraordinaire Lily Monster (Leila Chebbi), dressed all in black, apart from her umpteen pearl necklaces, and glittery headband. What a great way to end the show, a bewitching, choreographic display of grace, beauty, feathers, and dance. If tonight's act's are anything to go by we are hot footing it down to Liverpool on a more regular basis. 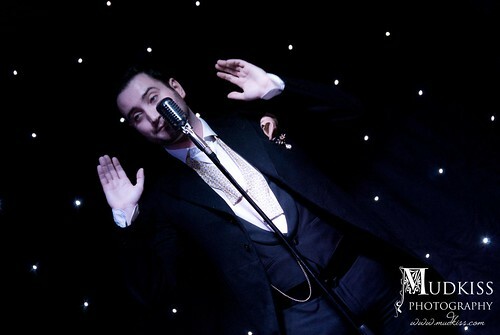 If your looking for a night of pure class, a touch of vintage, a bit of tongue in cheek humour, risqué performances and glamorous costumes, look no further than Moniques. We'll see you at the cocktail bar, the drinks are on you, make mine a Strawberry Daiquiri on the rocks!